When you’re a hero of today’s game. It was terribly unfair of the “Today’s Game Era Committee” of the Baseball Hall of Fame to put Harold Baines in this position. When they elected Baines to the Hall on Dec. 9, the TGEC did him an honor, but also made him the foremost case study for the knowledge gap between those who control the Hall’s official validation process and the fans whose faith is the only thing that gives the Hall any relevance. 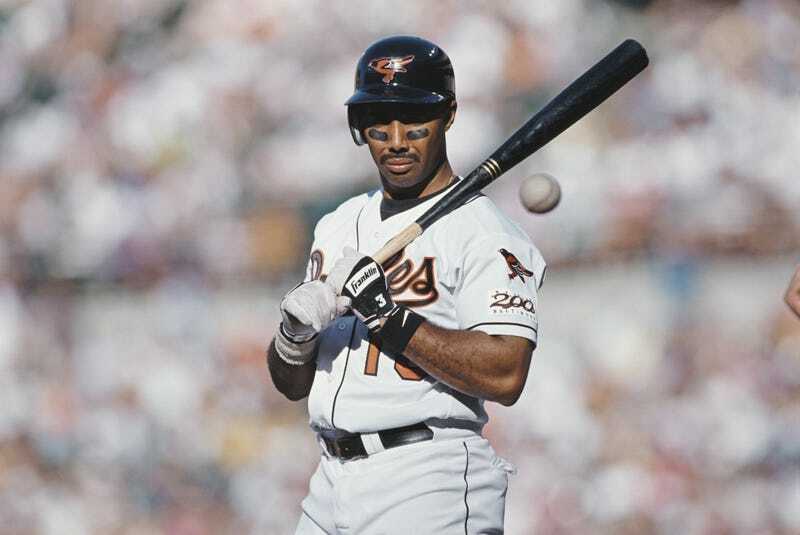 Baines was never really a MVP candidate and his bad knees meant that he spent 60 percent of his career as a designated hitter, but he was better at hitting a baseball than most humans who ever picked up a bat, and good enough at his impossible trade to stay employed until he was 42. His bad luck is that, thanks to sites like Baseball-Reference, FanGraphs, and Baseball Prospectus and the value statistics they popularized, it is very easy to put a selection of players into a lineup and figure out who doesn’t belong. This means that everything positive we can say about Baines can also be said of Kenny Lofton, Dwight Evans, Reggie Smith, Jim Edmonds, and many others, and that’s even if we’re just restricting things to Wins Above Replacement comparisons with fellow outfielder/DH types. The average fan knows this, now; the TCEG guys, who have no true historians or analysts among their merry band, apparently don’t. That said, the election of Baines doesn’t damage anything that wasn’t already broken. The Baseball Hall of Fame was originally inspired by the Hall of Fame for Great Americans in the Bronx, New York*, an effort to do for American history what Cooperstown tries to do for ballplayers. The problem with that Hall of Fame, as with what shall henceforth be known as the Baines Hall of Fame at Cooperstown, is that “fame” is an awfully loose term. The Bronx Hall, for instance, had room for both George Washington and Robert E. Lee; the one in Cooperstown has enshrined both the legendary Babe Ruth and the legendarily obscure Bobby Wallace, as well as both the barrier-shattering Jackie Robinson and the barrier-maintaining Tom Yawkey. What does—what could—“fame” even mean, here? Your answer is as good as anyone else’s, and therein lies Cooperstown’s permanent problem. Early on, voting for the Baseball Hall of Fame fell on the Baseball Writers Association of America. Quick quiz: Why did the BBWAA get this vote? They are super-qualified by virtue of their long experience questioning men in towels. What other 1930s-era group would you suggest? The Andrews Sisters? Judge Landis, the first commissioner, said they could, and what people who have been dead for 75 years says goes. All of the above, because even if 1) isn’t true, the BBWAA believes it is. The BBWAA’s initial definition of “fame” was really strict. Once Ruth, Ty Cobb, Cy Young, and the initial gang were in, they couldn’t find anyone else worthy. After 1939, the Hall’s management restricted the BBWAA vote to once every three years. In 1942, with virtually every ballplayer in history still outside, they elected Rogers Hornsby and stopped there. After returning in 1945, they once again failed to elect anyone. Nonplussed, management reinstated annual elections, in effect saying, “Go vote, damn it, and keep voting until you elect somebody!” Thus charged, the Writers mailed in their 1946 ballots. This time no one even came close. If you’re running a business like a Baseball Hall of Fame, this kind of persnickety posturing represents not a principled stand but a mortal threat to your personal economy. Very few people are going to drive to the hinterlands to spend money on a non-induction ceremony, or to visit a museum that hasn’t been updated in almost a decade. This was an emergency for the nascent Hall, and management overreacted accordingly. Frankie Frisch’s 1962 autobiography begins with these words: “I don’t think the major league baseball players of today can be compared to the old-timers.” That’s the first line. Then Frankie Frisch came along and made it all worse. Into the Hall went pitcher Jesse Haines, outfielder Chick Hafey, shortstop Dave Bancroft, outfielder Ross Youngs, and first baseman George Kelly. Even after Frisch suffered his fatal crash, the Committee kept picking players from his collection, tabbing first baseman Jim Bottomley, third baseman/outfielder Freddie Lindstrom, and shortstop Travis Jackson. None of these were bad players, but in many cases they are decidedly sub-Baines ones—not any better on a career basis than, say, Tino Martinez or Steve Trachsel. Not that the Frischians—he had to co-opt 11 other voters—stopped at old pals. During this period they also anointed pitcher Rube Marquard, center fielder Lloyd Waner, right fielder Harry Hooper, and several other soft selections. Waner, Kelly, and Lindstrom rank as the three least-accomplished 20th century Hall of Famers per Baseball-Reference’s formulation of WAR; Marquard and Haines are the least-accomplished starting pitchers. Note the reliance on the words “least accomplished” rather than “least qualified.” Again, there are no qualifications. There is only fame, and fame can be anything. Big round numbers like 3,000 and 500 and 300 are not only arbitrary, although they are that. They also require flexibility—if the rise of the bullpen means that there are going to be fewer 300-game winners, or none, then that shouldn’t also mean that there won’t be any more Hall-worthy pitchers. All are worthy, all are unworthy: The secret of the Baines Zone is that since fame is undefined, a player’s only true qualification is the story you can tell about him. If you believe Baines is worthy and can construct a narrative that shows that he is, others will believe you. That’s it. In the absence of objective facts, truth is just another argument you can win. We read “Hall of Fame” to mean Hall of Great, or Hall of Exceptional Accomplishment. But we haven’t defined those terms very rigorously, which means it can also be the Hall of Some of Us Really Like Jack Morris. That is much harder to do now than it was when all the Frischians had to do was say, “But Chick Hafey hit .317!” They kept the “back when everyone else hit .317” part sotto voce, naturally—they either didn’t know or they didn’t want to know, because whatever devalued Hafey’s statistics devalued Frisch’s as well. If you hadn’t spent some real time with the Baseball Encyclopedia, you probably weren’t equipped to dispute them. Post-Frisch, Hall managers tried to rein in the Committee by trying different, theoretically more discerning incarnations; the TGEC is the latest of these. The ongoing expansion of the Baines Zone shows they have failed. In the final analysis, the Hall of Fame is a museum, and museums tell stories. Even the Hall of Fame gallery, where the plaques are hung apart from the bat, ball, and uniform exhibits, purports to tell a story. It goes, in short, here are the best players ever to play American baseball. Because that collection consists almost entirely of players below the Ruth/Mays level, the Hall has always invoked cognitive dissonance—we read “Hall of Fame” to mean Hall of Great, or Hall of Exceptional Accomplishment. But we haven’t defined those terms very rigorously, which means it can also be the Hall of Some of Us Really Like Jack Morris. The democratization of knowledge necessarily leads to the delegitimization of “expert” committees. We know where the fault lines are. Can you tell the story of modern baseball without Barry Bonds and Roger Clemens? Nope. Can you tell it without Lou Whitaker, Bobby Grich, and Edgar Martinez? Perhaps, but there would be some significant gaps. Can you tell it without Harold Baines? Hell yeah you can, and everyone knows it. Our ballplayer-gods are good, or anyway good at baseball, but the priesthood is corrupt. Whatever the religion, whenever the time, we know where that leads. If that condition continues then the church confronts the inevitable, which is a loss of faith among even the most dedicated of believers. That wouldn’t be Harold Baines’s fault, either. *Correction: the post originally identified the The Hall of Fame for Great Americans in the Bronx as “defunct.” It is in fact still open, although The Cultural Landscape Foundation did recently include the Hall of Fame for Great Americans as a threatened and at-risk cultural landscape. Steven Goldman is a writer, editor, and host of the Infinite Inning podcast.